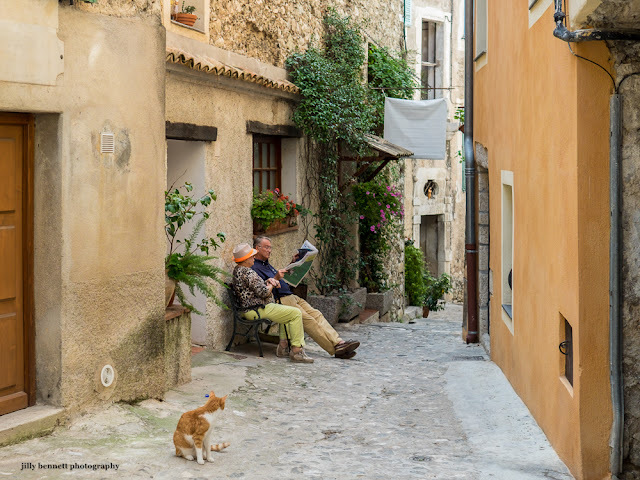 A bench outside a house in Gorbio makes a welcome place to rest for these visitors. It was the orange tones - the wall, the door, the cat, the woman's hat - that caught my eye. Un banc à l'extérieur d'une maison à Gorbio est un lieu d'accueil reposant pour ces visiteurs. Ce sont les tons orange - le mur, la porte, le chat, le chapeau de la femme - qui ont attiré mon oeil. I love the adobe look and color to the photo. The inquisitive cat is a charming addition to the photo. The cat catches my eye- very similar in looks to one that lives near my place. What a lovely photo, so nice to see a cat there, too. I could see myself happily living in a place like that.